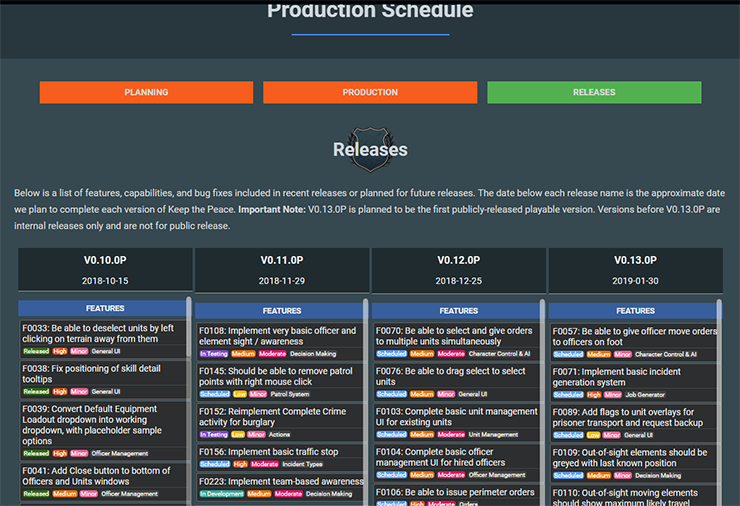 I just pushed live an update to our Production Schedule that Alpha Team members have access to and which is available here: https://playktp.com/schedule/ . The new pages should be easier to read, have a little more information, and -- most importantly -- are now linked to our new project management system, and thus you'll see updates much more frequently. Let me know what you think! Throughout this week I'll be adding to the schedule a number of additional features and improvements we're considering or planning. I'm also working on an updated long-term roadmap, so look out for that in the near future as well. Posted: 25/11/2018 8:25 pm. FlaviusCZ, Flixter101 and Kai liked. Far more user friendly than the old project management system. Cheers Nick! Posted: 25/11/2018 10:44 pm. Flixter101 liked. Posted: 26/11/2018 12:57 pm. FlaviusCZ liked. Looks great! Can’t wait till the beta/prototype release! This looks proper fresh ! Thanks Nick, for sharing the out look of the game,gives us guys a real idea how you plan the game to move forward,thanks bud. Sorry I didn't join Alpha sooner, alot of things have happened since May.